Welcome to the Supertel Inn in Key Largo dive capital of the world. The Suites at Key Largo Supertel Inn is conveniently located on the largest of Florida's Keys off US-1 mile marker 100 on picturesque Ocean Drive. The townhouse style hotel is conveniently located on the waters of John Pennekamp State Park and adjacent to the Key Largo National Marine Sanctuary with 200 square miles of coral reefs, sea grass beds, and mangrove swamps. Be sure to explore the local parks both above and below the surface with glass bottom boats, canoeing and scuba diving available through the local shops. Sundiver snorkeling tours are available on property. Special hotel features and amenities include: 40 unit townhouse suites Queen size beds, sofa sleeper, two bathrooms and fully equipped kitchens Two 27-inch TVs Boat dockage available Extended stay rates available Bus and truck parking are located on the property as an added guest convenience. A wide variety of restaurants, cocktail lounges and specialty shops are located in the surrounding area. All guest rooms come equipped with coffee makers, irons, ironing boards, and two televisions with free HBOÂ®. Handicap accessible rooms are provided upon request. 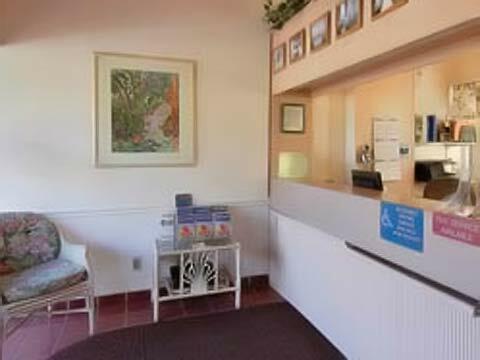 Whether traveling for business or pleasure, the Supertel Inn provides excellent accommodations, a convenient location, attentive staff and an incredible value to everyone visiting the Keys. Our friendly staff looks forward to serving you soon.